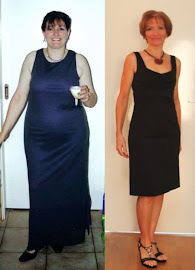 FitBody Fifty: Cheese and marshmallows? Together? This morning, I had the pleasure of hanging out with Marshmallow, of Do you have an extra-large in this? fame. She's having a short and relaxing holiday here in Melbourne, and willingly got up early to make the trek from her hotel all the way out to the far-flung outer suburbs - where we may not have beaches, nightclubs, trendy bars and cafes, but we have our own (peculiar) way of entertaining overseas visitors. 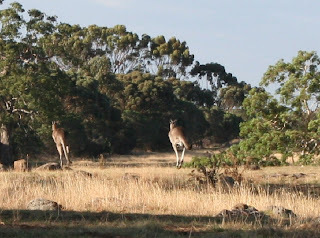 Our main destination was the parkland near home, where I parked the car and we set off on foot to visit the local kangaroos. 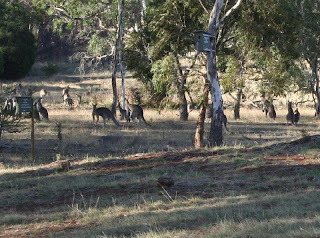 There were maybe fifty or so today, just hanging about. Next on the itinerary was a quick tour of the house and then it was down to the serious business: food. First we headed off for brunch at my favourite nursery-cafe. It was close call between the pancakes, the French toast and the 17 egg dishes, but eggs won the toss for both of us. Then a short drive north to a local orchard, where nothing much appealed. The berries are finished, the drought hasn't done their plums any favours, and while 5kg of apples were selling for a bargain price, I don't really need that many. I love spending time with bloggers who appreciate good food. And who don't find anything odd about doing a tour of the fruit and veg shop. I mean, who doesn't find dates, berries, mushrooms and broccoli fascinating? DUDE! Can't believe I missed Marshy by one week. I know, DG. Said the same thing myself... bad timing. Can you imagine what TROUBLE we would've gotten up to if all three of us were in the Donnybrook Farmhouse - oh MAN, cheese tasting would've gone to a whoooooole other level! Heehee ....Dietgirl, Marshmallow and Kek surrounded by cheese. You're very, very welcome, Marshy - honestly, the pleasure was all mine.